Playing in just his second Masters, the Ulsterman raced to five under par before wayward tee shots cost him strokes at the end of what was still an impressive opening round. 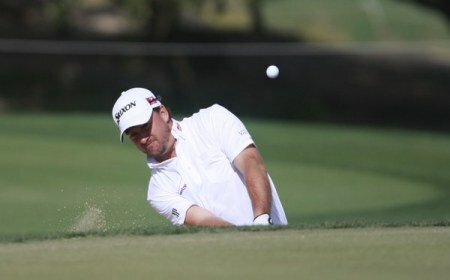 “I’m happy with a 69 round here,” McDowell said. “I hit a couple of loose tee shots the last two holes and paid the price for them but generally hit the ball well and into all the right places. McDowell was happy to let Padraig Harrington and Rory McIlroy hog the limelight as he completed a low key build up to the opening major of the season. And he believes he is playing well enough to be a factor on the leaderboard at the weekend. He said: “I hit it well today and was disciplined in positioning it well. I drove the ball well generally. Couple of loose ones here and there and felt really good on the greens and felt my preparation stood me in good stead and I am looking forward to the weekend. The Portrush man opened with two birdies and while he bogeyed the par three fourth he picked up shots at the eighth, 12th, 15th and 16th to get to five-under before making those late mistakes. At the 17th he was forced to chip out of the trees while at the last he was in pine straw on the left and missed a 20 footer after bunkering his approach. He added: “It is a course I am just learning how to play it. The more I play it the more I learn. It is an exciting golf course. There are birdies out there and mistakes out there and every golf shot needs your attention.